A work breakdown structure (WBS) is a key project deliverable that organizes the team's work into manageable sections. The Project Management Body of Knowledge (PMBOK) defines the work breakdown structure as a "deliverable oriented hierarchical decomposition of the work to be executed by the project team." The work breakdown structure visually defines the scope into manageable chunks that a project team can understand, as each level of the work breakdown structure provides further definition and detail. Figure 1(below) depicts a sample work breakdown structure with three levels defined. The project team creates the project work breakdown structure by identifying the major functional deliverables and subdividing those deliverables into smaller systems and sub-deliverables. These sub-deliverables are further decomposed until a single person can be assigned. At this level, the specific work packages required to produce the sub- deliverable are identified and grouped together. The work package represents the list of tasks or "to-dos" to produce the specific unit of work. If you've seen detailed project schedules, then you'll recognize the tasks under the work package as the "stuff" people need to complete by a specific time and within a specific level of effort. From a cost perspective, these work packages are usually grouped and assigned to a specific department to produce the work. These departments, or cost accounts, are defined in an organizational breakdown structure and are allocated a budget to produce the specific deliverables. By integrating the cost accounts from the organizational breakdown structure and the project's work breakdown structure, the entire organization can track financial progress in addition to project performance. Creating a Work Breakdown Structure is a team effort and is the culmination of multiple inputs and perspectives for the given project. One effective technique is to organize a brainstorming session with the various departments that will be involved with the project. Project teams can use low-technology tools like a white board, note cards, or sticky note pads to identify major deliverables, sub-deliverables, and specific work packages. These cards can be taped to a wall and reorganized as the team discusses the major deliverables and work packages involved in the project. The low-technology approach is easy to do; however, it does not work well with distributed teams or translate easily into an electronic format. There are several tools available that support mind mapping, brainstorming, and work breakdown structures. 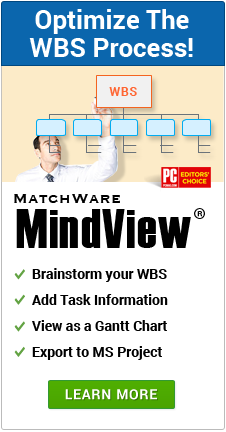 MatchWare MindView is an easy-to-use mind mapping software package that supports work breakdown structures, project outlines, Gantt charts, and exports easily into Microsoft Project for further schedule definition. 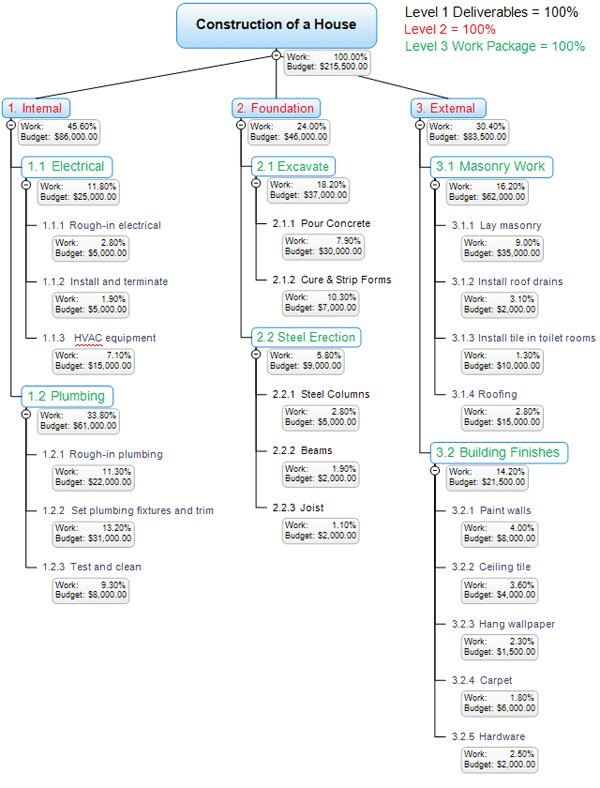 Figure 3 provides an example of a work breakdown structure using Matchware MindView. The key benefit to MatchWare MindView is its ease-of-use translating work breakdown structures into high level project schedules. A natural extension of the work breakdown structure is the project schedule. By brainstorming the project scope in a mind mapping tool, the project manager can easily assign budget and duration estimates. These budget and duration estimates can easily be exported into Microsoft Excel or Microsoft Project for additional planning and analysis. Project managers want tools that help accelerate their work and reduce the administrative burden that accompanies project management processes. 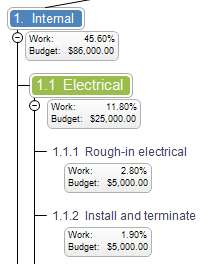 Learn how to use MindView to easily create your Work Breakdown Structure / WBS. Apply numbering scheme, completion percentage (100% rule), resources, cost calculation, and more. This video also demonstrates different views as Timelines, Gantt chart, and mind map, as well as several export functions including MS Excel, MS Word, MS Project, etc. 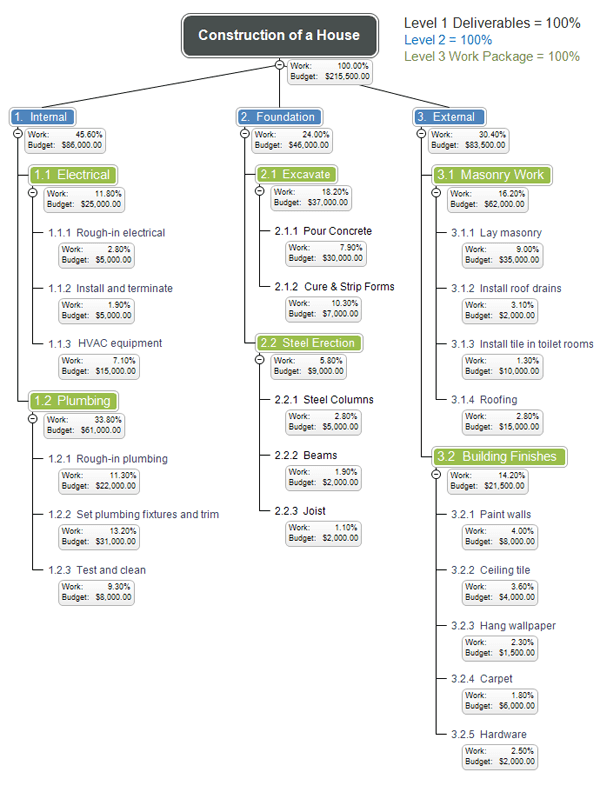 "This Work breakdown structure was made using MatchWare MindView 4". Click here to build your own work breakdown structure. Create a WBS with the MindView software free trial. Check it out. Copyright © 2019 workbreakdownstructure.com. All rights reserved. Sitemap.